The Baylor University Board of Regents will reportedly vote Monday on whether to suspend head football coach Art Briles for one season rather than go through with outing him completely. Briles was fired last month after an independent investigation said school and team administrators worked to cover up allegations of sexual violence against members of the football team. That move has not been finalised yet, and according to Horns Digest, several high-power figures around Baylor feel former president Ken Starr — who ultimately resigned as a result of the scandal — bears the blame for the scandal, namely for not having a Title IX coordinator in place at the school from 2011-2014. Briles reportedly met with some big donors about working to possibly change his dismissal to a one-year suspension, and several donors and boosters are reportedly threatening to stop donating to the school altogether so long as Briles remains out. 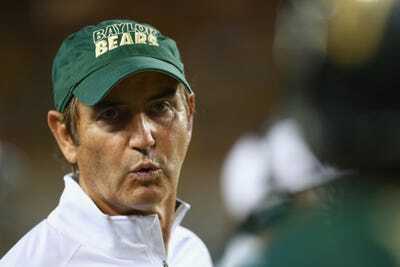 If the votes aren’t there to bring back Briles after a one-year suspension, the school would likely settle with Briles for between $15 million and $25 million, sources said. Briles had eight years and just under $40 million guaranteed left on his contract at Baylor, sources told HD. Horns Digest also said that nearly a dozen incoming freshman have requested out of their letters intent to play at Baylor now that Briles is gone. When a coach brings national prominence in football to a wealthy school like Baylor, he is going to pick up some important friends along the way. Those friends now appear to be stepping up for Briles.